I basically just coloured my own Embossing Paste with some distress inks. I used the Large Moroccan Stencil by Simon Says Stamp and used some palette knives to spread all four colours over the stencil. I set that aside to dry and just a little tip, make sure you clean off you stencils and palette knives really well. You don't want that embossing paste to harden at all on either. Also, make sure your palette knives have no moisture left on them after they're clean or they'll rust. I've ruined a few doing this. So while the panel was drying. I grabbed some white cardstock and coloured it with some Mustard Seed and Squeezed Lemonade distress ink. I then die cut the sentiment 'you' from the Big You Die also from Simon Says Stamp from the coloured piece. I then used some yellow fun foam from my stash, die cut the you sentiment again and adhered the two together. I used the Hello You stamp set by Simon Says Stamp to stamp the other part of the sentiment. 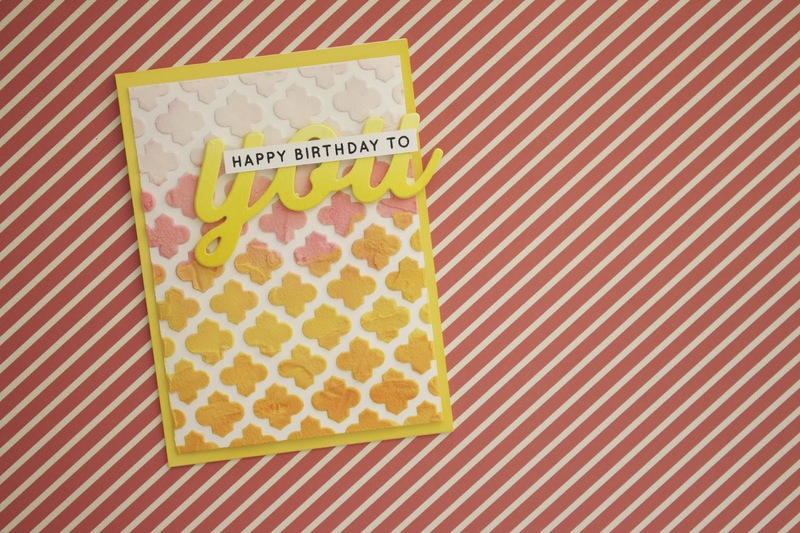 I adhered them onto the card and then used Sour Lemon cardstock by Bazzill for the layer on the cardbase. I got the colour inspiration from here..